Want to improve national security without spending billions on a new weapons system? Slim down America’s kids and teach them to read, some retired generals say. The U.S. Army says more than three-fourths of 17- to 24-year-olds today are not eligible to join the military because they aren’t fit enough or don’t meet other basic requirements, such as having a high school diploma or being able to read or write properly. That’s got some of the nation’s highest-ranking retired military officials advocating for a radical way to improve national security — improve the lives of children. “It’s not just a school problem. It’s not just a Department (of Education) problem. It’s a national security issue and it needs to be prioritized that way,” said retired Major General D. Allen Youngman. He’s one of hundreds of former military brass who have gotten involved in Mission: Readiness, a nonprofit organization whose “Too Fat to Fight” reports attack junk food in schools and other issues, and whose members lobby lawmakers for improved school lunches and more widely available pre-K education. These military officials say such interventions are necessary for increasing the pool of people who both want to serve in the military and would be able to do so. “If you have a very small (group) who are interested to begin with, and then the majority are not qualified, you can get into a pickle quickly,” Youngman said. Current military officials agree that the nation’s obesity epidemic has created a serious problem, currently and for the next generation of soldiers. They say the military also is starting to address the issue, with efforts such as improving nutrition for current service members and by trying to help military families promote healthy eating and exercise habits with their children. 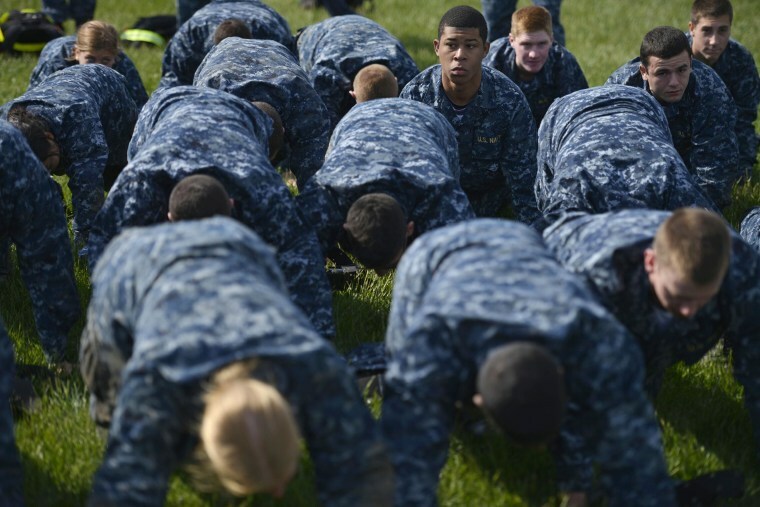 “If we really need the service now and of the future to be more physically fit and healthy, we certainly find that we can engage as a country .. how to address strategies of healthy living,” said Public Health Service Capt. Kimberly Elenberg, program manager for population health at the Defense Health Agency. The effort comes amid proposals to reduce the number of U.S. troops significantly following lengthy conflicts in Iraq and Afghanistan, and it also coincides with an ever-more technologically advanced military operation. Despite those two trends, experts say it’s still going to be just as important to have fit, able soldiers in a generation to come. “There’s nothing about war that is becoming fundamentally less physically demanding, for at least half the people on the battlefield,” said Michael O’Hanlon, director of research for the foreign policy program at the Brookings Institution, a think tank. O’Hanlon said that’s because, despite its best efforts, the military may not be able to avoid messy, on-the-ground conflicts in countries where there are massive humanitarian violations or other lawlessness. Even if their military duties don’t require on-the-ground combat, Elenberg said troops need to be in good shape. Nurses must be able to carry a large load of equipment to help the wounded. Service members on ships need to be able to nimbly climb vertical ladders from deck to deck. And personnel on submarines need to be fit enough to stay alert for hours on end. Youngman said many civilians also don’t realize that the soldiers of today and tomorrow are expected to be more prepared in other ways. Gone are the days when high school dropouts could show up and expect the military to whip them into shape. The military now says many potential candidates are rejected because they don’t have a high school diploma or meet basic literacy requirements. “This is a very, very different military now,” Youngman said. Advocates say they are pushing for things like healthy food for school children and better early childhood education because that can provide the building blocks for healthier American adults, in the military and out of it. But they emphasize that they are by no means trying to recruit young children. “Nobody’s trying to put toddlers in camo,” said Amy Dawson Taggart, national director of Mission: Readiness. The nonprofit, an arm of the Council for a Strong America, receives funding from Boeing, the Bill & Melinda Gates Foundation, Pew Charitable Trusts and many others. It does not receive government funding, Taggart said. Taggart concedes that retired, high-ranking military personnel are not your “usual suspects” for lobbying on children’s health and well-being. She said that might be one reason they have been able to command the attention of lawmakers and other people who might not have heeded these issues in the past. “I think what we are seeing is the kind of traction (of) that unexpected messenger,” she said.